$35.00 In stock - low quantity. Order in the next 47 minutes and it will go out today! In stock - low quantity. Order in the next 47 minutes and it will go out today! LEAST FAVORITE FLAVOR - Display all five flavors of Spree's in your hand. Ask your spectator to name their least favorite flavor- the one they'd choose to put back in the pack. Let's say they name orange. Close your fingers over the Sprees. When you open your hand the orange spree is missing and appears on the end an open pack Sprees! 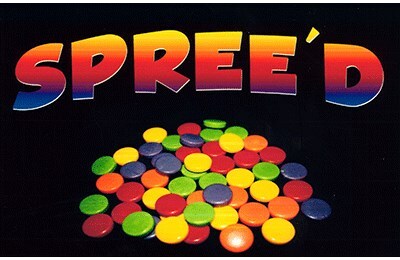 SPREE'CHEROO - A red spree sits at the open end of a pack of Sprees. A green spree sits in your palm. The two Sprees instantly change places. Both can instantly be handed out. TRAFFIC LIGHT- Hopping Halves with everyday candies. Showa red, yellow and green Spree. One by one you place them in your pocket, as one by one they return to your hand. Comes complete with all necessary gimmicks and a DVD with some routines to get started.